A group of Sri Lankan nationals who were deported to Sri Lanka after they had illegally left for Reunion Island, reached the Bandaranaike International Airport this evening (Feb 14). The group consisting of 64 Sri Lankan nationals was arrested by French security personnel and later sent back to Sri Lanka via a Boeing 737-800 air carrier that touched down in Sri Lanka at around 2.55 pm. 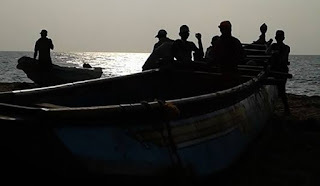 The illegal migrants comprise of 54 men, 06 women, and 04 children who are residents of Jaffna, Negombo, and Halawatha. They were brought back by 70 French security officials who had left Sri Lanka at around 4.30 pm today. The French Embassy in Sri Lanka had made the necessary arrangements to bring back the migrants who had been handed over to officials of the Immigration and Emigration Department at the airport. Measures have been taken to handover the suspects to the State Intelligence Service personnel for further action.